It Stand for Global System for Mobile. It's a Second generation cellular system standard and was devloped to replace incompactible Analog System. According to COAI, In Feb 2012 GSM Subscriber base is 656,86 million and Relaince & Tatadocomo subscriber are not included in counting. 2. Without any SIM you can't access with mobile.You need both Mobile phone and SIM. 3. One more remarkable thing if you fed up with your hendset model just through it and use SIM (Service) with another handset. In GSM There is on air privacywhich is provided by system. In Analog system this was easy to moniter the conversation But in GSM encryption is take place by GSM transmitter. 1. Cryptography lgorithmn is used in it and a secret key is used which is known only to cellular carrier. 2. Key is change every time with every user. It stands for mobile station, any equipment, mobile. Power level .8w - 20w . Moniters signal quality around cells. 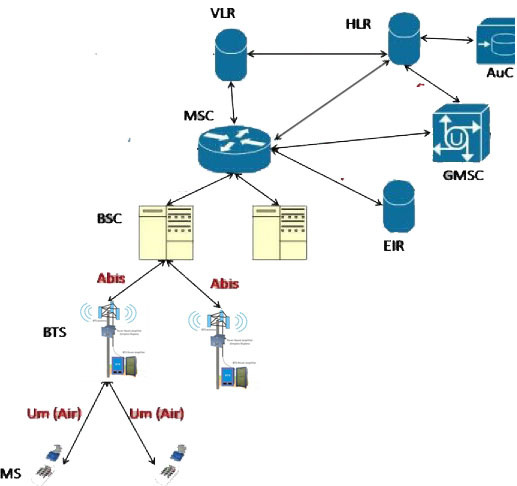 It is the section of a traditional cellular telephone network which is responsible for handling traffic and signalling between a mobile phone and NSS (Network Switching System). It Stands for Base Station Transceiver. It consist a equipment for transmitting & receiving radio signals. Have a encrypting equipment to encryption and decryption with BSC (Base Sation Controller). BTS is controlled by BSC via BSF (Base Station Control Function). The aera covered by a BTS is called cell. click here for detail information of cells. It Stands for Base Station Controller. Typically a BSC has 10 or even 100 BTS under its control. It Communicates with BTS & MSC. BSC handles - 1. Allocation of Radio Channels , 2. Control Handover from BTS to BTS. It Stands for Mobile Switching Center. MSC connects Base Station to entire Cellular System to PSTN. A Typical MSC handles 100000 cellular subscriber and 5000 simultaneously conversation at a time. It function is channel allotment , call setup function,Billing Information. Mobality management- 1. Registration, 2. Location Updatation, 3. Inter BSS and Inter MSC call Handoff. Does Gateway function while its customer rome to other network by using HLR and VLR. 1. HLR (Home Location Register): It is a database contains subscriber information and location information for each user resides in the same city as the MSC.Each subscriber is assigned a unique IMSI (International Mobile Subscriber Indentity) for identifying each home user. 2. VLR(Visitor location Register): Database which temporaily stores IMSI and Customer information. It have information of every visitor in area in term of its IMSI. When roaming mobile logged in the VLR, The MSC Sends the Necessary information to visiting subscriber HLR so That calls in the roaming mobile can be properly routed over PSTN by roming Uder HLR. It Stands for authentication center. A Strongly protected database handles - 1. Authentication, 2.Encryption key for every single subscriber in HLR & VLR. AUC contains a register called EIR(Equipment Indentity Register),Identifies stolen or fraud altered phone that transmitted information not match with HLR & VLR. It supports OMC(Operation Maintanance Center),used to moniter and maintain the performance of each MS, BS, BSC and Msc with a GSM system. 1. To maintain all telecommunication hardware and network operation with a particular market. 2. Maintaining all charging and billing procedures.